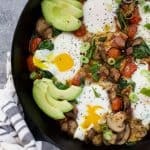 An easy gluten free Spinach Mushroom Breakfast Skillet that comes together in less than 30 minutes! 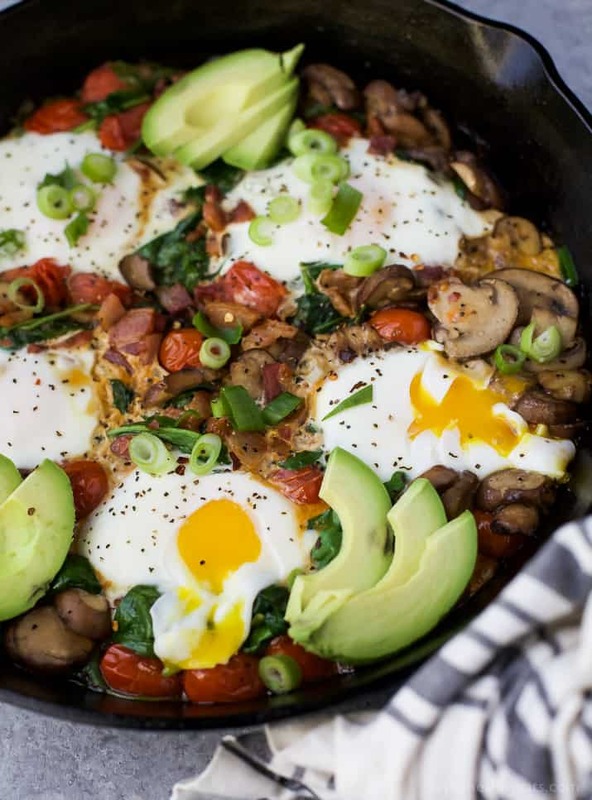 An easy gluten free Spinach Mushroom Breakfast Skillet that comes together in less than 30 minutes! 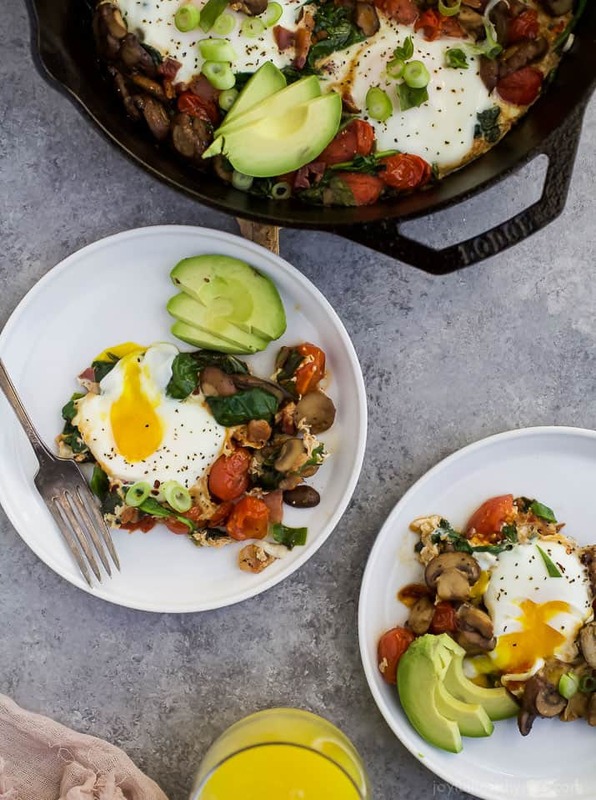 This Breakfast Skillet is loaded with fiber and then topped with a runny egg and avocado. 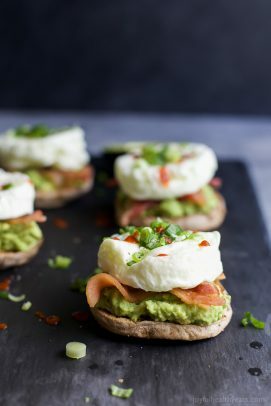 Perfect for brunch or dinner! It’s been almost 2 weeks since Madison’s been here. And I seriously can’t believe it! Every time I look at her it’s surreal to me that after 4 years of waiting, praying and crying out to the Lord that she is finally here in the flesh and blood. Now I’m crying and praying for a whole other reason. Crying with joy and thankfulness and praying for her protection. And for REST… after 5 years of sleep you forget what it’s like to go back to newborn status. Waking up in the middle of the night and feeding every three hours definitely takes a toll on the good ole body that’s for sure. The good news is when you’re in love with something that much those late night feedings don’t seem as bad and by God’s grace you wake up feeling somewhat refreshed in the morning. It’s amazing to me how much less sleep you can live on and still function. Although, I’ll be glad to get back to sleeping through the night again. Fingers crossed it happens at 8 weeks like it did for Cason. With all the crazy going on over here the blog has definitely taken a back seat these days. I am so thankful that I was able to work ahead on recipes and photos so that I don’t have to worry about it as much now. These days it’s just about editing photos and writing a post, which is a lot more manageable in between feedings. It is funny to look back at some of my older posts on the blog and see pictures of Cason when he was little and throughout the years as he’s grown. He has always helped me with cooking in the kitchen and even helps me take photos at times, although he loves to make sure he is in those photos as well. haha. I can’t wait to do that with Madison. What an amazing profession I have. I get to cook and eat for a living, share my heart with all of you AND I still get to stay home and be MOM. Ok, enough of the emotional stuff. Let’s move on to today’s recipe shall we? One of my husbands favorite things to have is sautéed spinach. He loves it. It’s probably his go to side dish when we order out. Mine on the other hand is tomatoes. I love them in any form – fresh, roasted, sautéed till they burst, grilled. You name it, I’ll eat it! 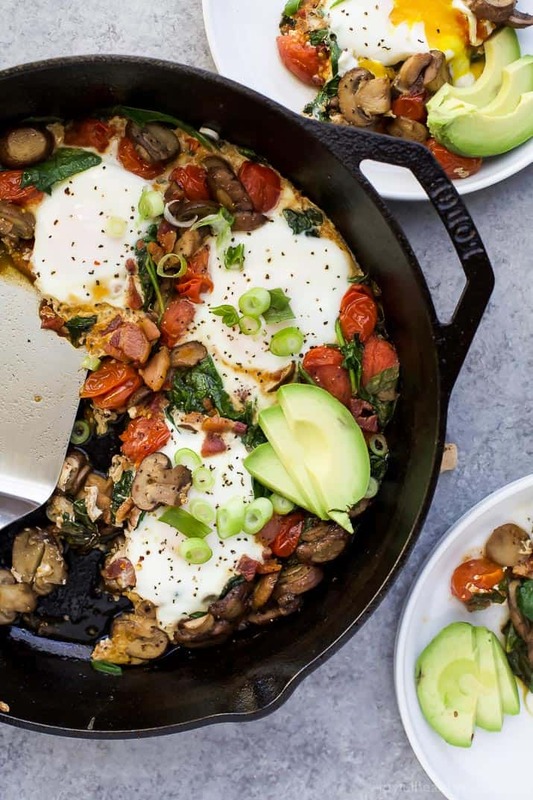 This Spinach Mushroom Breakfast Skillet has the best of both worlds – sautéed spinach, earthy mushrooms, burst skillet tomatoes, salty pancetta and then eggs. Because what’s a breakfast skillet without some egg yolk action, am I right? 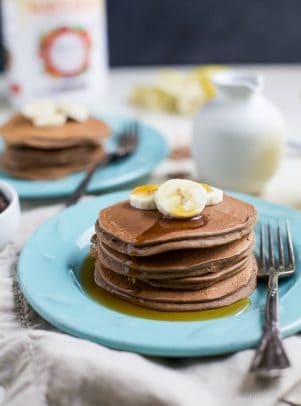 This recipe is great for a weekend breakfast with the family, but we ate it as dinner one night with some fresh fruit. It’s perfection. 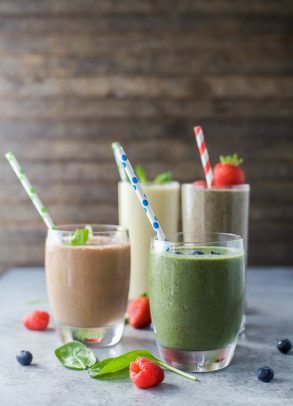 Filled with veggies, all kinds of flavors and loaded with good for you nutrients. 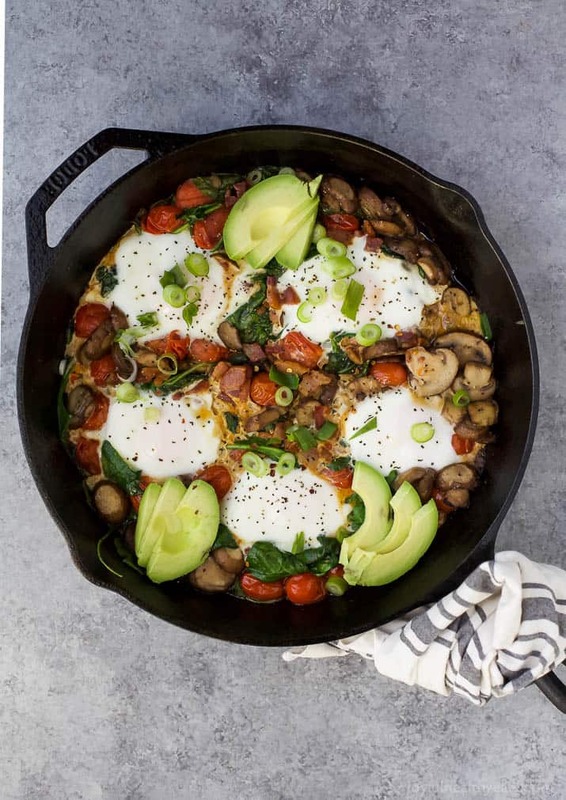 An easy gluten free Spinach Mushroom Breakfast Skillet that comes together in less than 30 minutes! This Breakfast Skillet is loaded with fiber, protein and flavor your family will love. 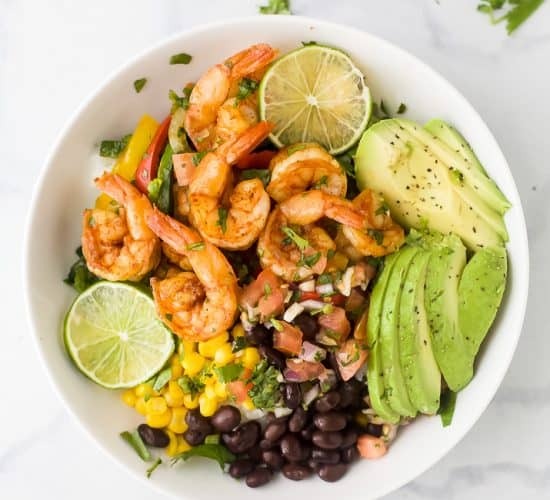 Perfect for brunch or dinner! Add grape seed to pan along with diced pancetta. Saute until pancetta is slightly browned, about 3-5 minutes. 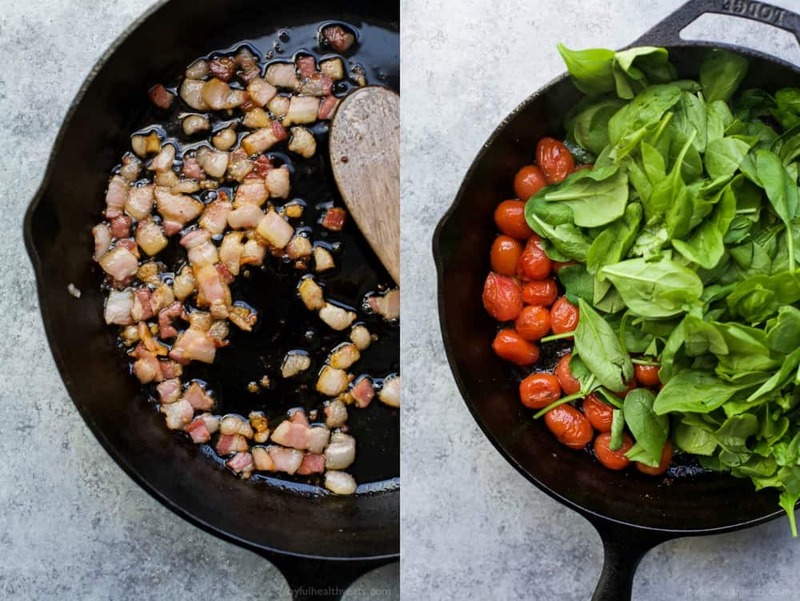 Remove pancetta from pan with a slotted spoon and set on a plate. To the skillet add sliced baby bella mushrooms. Cook for 3-4 minutes per side so they are slightly browned on both sides. Season with salt and pepper. Remove the mushrooms from the pan and place on the same plate the pancetta is on. To the same skillet add cherry tomatoes. Saute until they just start to burst, stirring the whole time. Approximately 3-4 minutes. Next add in spinach and saute until just wilted, about 2 minutes. Add mushrooms and pancetta back to the pan, stir to combine everything back together. Next, make 5 wells/holes in the veggie mixture. Crack one egg into each well. Turn the heat down to medium low. Cover the skillet. Cook eggs for 2-3 minutes for a running yolk and so the egg whites cook. Cook longer if you’d like a more well done egg. Remove skillet from heat. Season with salt and pepper to taste. 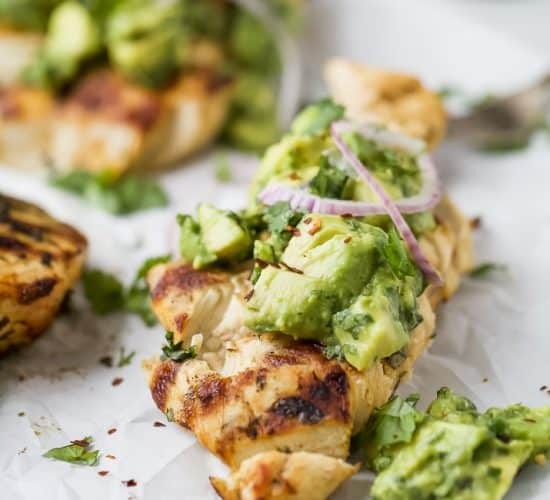 Garnish with sliced green onions and sliced avocado. 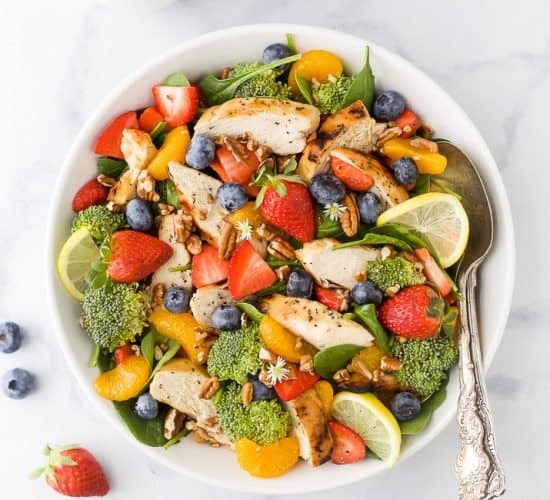 This looks delicious, Krista! Will definitely be trying with my fam, and congratulations on our new baby girl, Madison! Congratulations on your new little girl! Having suffered through infertility myself, I know how extra special that little baby is. Enjoy! I’ll be trying out this skillet on the weekend. Thank you so much Lynn. That means a lot! This answers my question for “what’s for dinner tonight?”!! Yum!! All of those veggies are making me so happy! 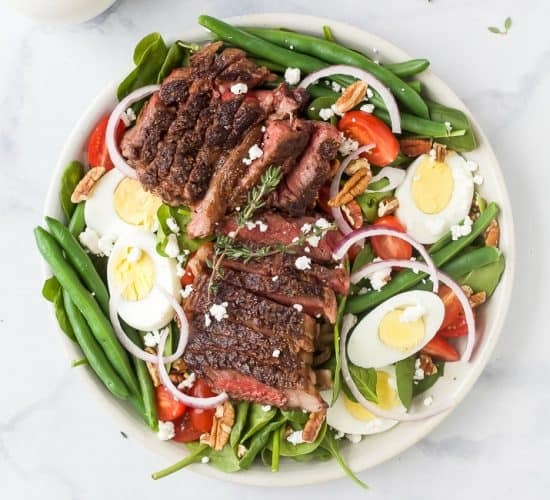 I love everything about this dish, and will be trying it in the morning! 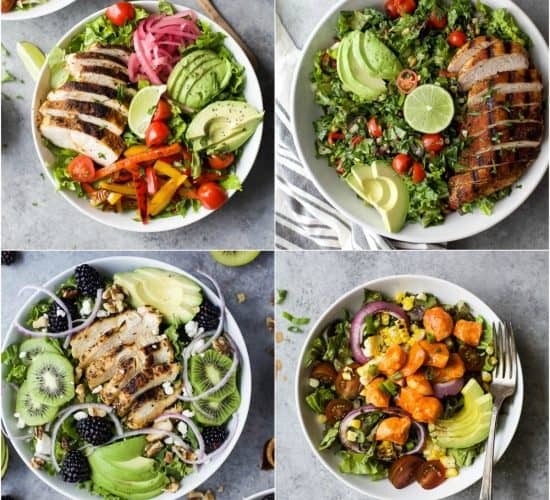 Packed full of amazing flavors! This is a must-make this weekend! 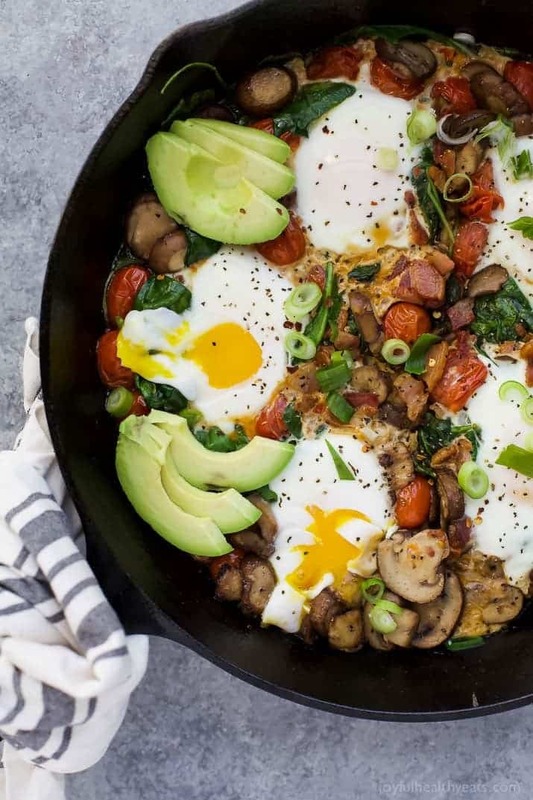 This breakfast skillet sounds perfect for a weekend brunch! So delicious! Mmmm I love all the veggies in this! 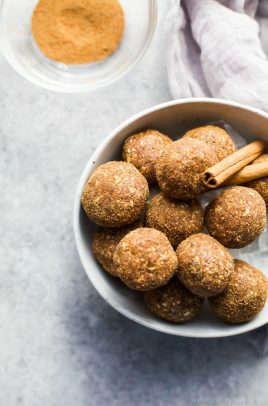 Such a great healthy way to start (or end) the day! Ohhh thank you so much Lauren!